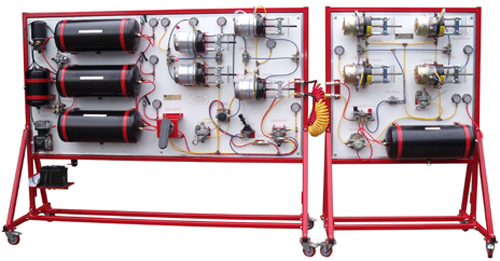 Fully operational 2-line Air Brake Tractor/Trailer Trainer manufactured from new components. Compressor (not driven: outside air supply required). Air Dryer. Air Tanks: Front, Rear and Secondary. Multi-Circuit protection valve. Foot Pedal: dual foot valve. Spring brake actuators. Load sensor valve. Park brake control valve. Trailer control valve, supply dump valve, pre-dominance valve. Double check valve, warning buzzer & Suzie connectors. Relay valve. Quick release valves. One way valve. Circuit pressure gauges. Circuit pressure tap-in points. Suzie connector plugs. Combined park/shunt valve. Relay emergency valve. Trailer air tank. Load sensor valve. Spring brake actuators. Quick release valves. Double check valve. Circuit pressure gauges.